There are events in history that tell us much about the era’s social views and prejudices. The Komagata Maru incident is one of those. One hundred years ago a ship named the Komagata Maru dropped anchor in Vancouver with 376 passengers on board. The majority of these passengers were Sikh men (and British subjects) intending to immigrate to Canada. The journey was a challenge to a Canadian law that prevented immigration aboard ships that had not travelled by ‘continuous journey’ from their country of origin. Most passengers were prevented from ever leaving the ship. It sat moored for two months while immigration officials argued in support of the entry ban and the courts deliberated before being forced out and back to India, where they were shot at by British Indian troops where most men were either killed, injured, imprisoned or forced into exile. The Centre for Indo-Canadian Studies at the University of the Fraser Valley is marking this pivotal moment in Canadian and British Empire history with a specially commissioned play. That Land Beyond the Waves will debut on Saturday, Nov. 1 at the Matsqui Centennial Auditorium (with a matinee performance to follow on Nov. 2). “In many ways, the Komagata Maru incident was the beginning of the end for the British Empire,” says Satwinder Bains, Director of the UFV Centre for Indo-Canadian Studies. “Indians were dismayed by the lack of British response to this display of racism in a British colony, and it helped spark pro-national enthusiasm among the Indian diaspora settled in the Pacific Northwest. Prime Minister Stephen Harper apologized for the Komagata Maru incident at a public event in Surrey in 2008. The B.C. government also formally apologized in the legislature. 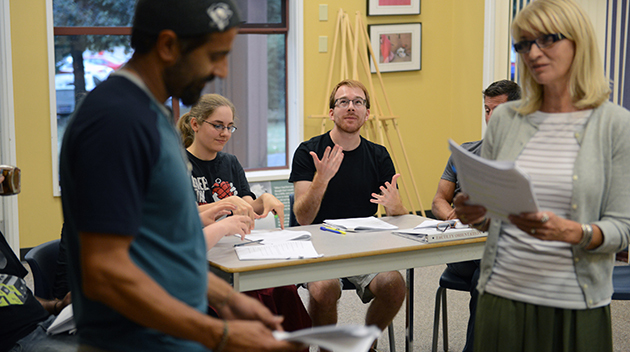 Rajnish Dhawan, an English professor at UFV, was commissioned to write the latest play about the incident. His colleague John Carroll is directing the play. The play examines the Komagata Maru incident from the perspective of both an Indian immigrant whose sister is on the ship and the European-Canadians he works for in the town of Abbotsford, B.C. Sharanjit Sandhra of the CICS says that theatre is a way of bringing history to life, especially for children. That Land Beyond the Waves plays Sat, Nov 1 at 7 pm and Sun, Nov 2 at 2 pm at the Matsqui Centennial Auditorium. Doors open 30 minutes before the performance. Tickets are $15 for the general public and $10 for students. Tickets available here or by following the link from www.ufv.ca/cics. For further details or call 604 851-6325. To complement the play and ongoing until Dec. 2014, an exhibition titled Challenge and Denial: Komagata Maru 100 Years Later 1914-2014 is on display at the Sikh Heritage Museum located in the National Historic Site, Gur Sikh Temple in Abbotsford. Tickets are still available–come out and support these amazing actors/players!